Port of Dar es Salaam. The Bagamoyo project framework agreement was signed on March 24, 2013 to enhance competition along the East African coast and supplement the Tanzanian ports of Dar es Salaam and Mtwara. "We had not abandoned this project. We were waiting to compensate the people whose land was taken for development of various business programmes," he said. Retired President Jakaya Kikwete touted the project during his term, vowing to construct Tanzania's biggest port at the former slave harbour with funding from Oman and China. The Bagamoyo port and its affiliate industrial zone is meant to address congestion at the old port and support Tanzania to become East Africa's leading shipping and logistics centre. 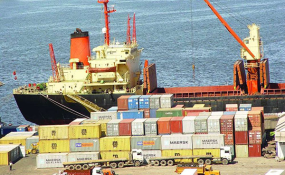 The port is located about 75 kilometres from Dar es Salaam and 10 kilometres from Bagamoyo town. Copyright © 2017 The East African. All rights reserved. Distributed by AllAfrica Global Media (allAfrica.com). To contact the copyright holder directly for corrections — or for permission to republish or make other authorized use of this material, click here. Tanzania: Have We Seen the Last of Diamond-Zari Drama?